Why You Need Our BEST DEAL OFFER: Our tile roof tune up service helps protect and maintain the integrity of your tile roof, as well as extending the the life by several years. During the initial roof inspection we will bring any other areas that are in need of repair to your attention and provide a professional long term solution to the maintenance needed to be done. 1. Complete roof inspection and roof life evaluation of your roof system (s). 2. Inspect for broken, cracked, or missing roof tiles or roofing. 3. Inspect for slipped, loose, or displaced tiles or roofing. 4. Inspect broken, cracked,crumbling, or missing roof mortar. 5. Inspect roof chimney, roof fireplace, and skyligts for proper roof flashing. 6. Inspect all plumbing and heating flashing for proper flashing, caps, and storm collars. 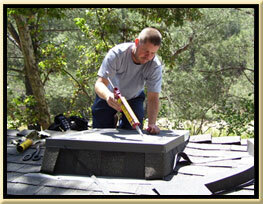 Please Read on before hiring a Trabuco Canyon Roofer. Why should you hire us? Correctly repairing your old tile roof takes more than just a willingness to get up on your roof and start taking it apart. You need someone who has done this a hundred times before. Most of the tasks involved in repairing your tile roof are difficult to do and can and will overwhelm most experienced roofers. Just the simple task of properly walking on the roof is not taken for granted here. If the individual repairing your roof has not personally repaired hundreds of tile roofs you have what we call "someone who is still learning". It takes so many repairs to become an expert in tile roof repairs as there are many different types of tile roofs and the leak sources are endless. Even an experienced roofer would probably look inexperienced on one of our repair crews. Having an owner who has personally repaired 100's of tile roofs being directly involved combined with experienced employees with personalized training allows us to offer one of the industries longest and strongest tile roof repair warranties in the business. Your "No Leak" tile roof repair warranty is not limited to a certain number of service calls (i.e. after a certain point you have to pay again), nor does it come with hidden fees. It does come with a time tested guarantee that if we can't stop the leak then all of your money is returned without quarrel. With over 1000 tile roof repairs done since 1994 we have not had to return a single payment. Call us now to schedule your Trabuco Canyon roof tune up for $199.00. * limited to standard roof pitch and concrete roofing tiles only. * limited to concrete tile roofs only (spanish clay tile roofs are $229.00). * Appointments must be scheduled Mon-Friday 9:00 - 4:00pm. 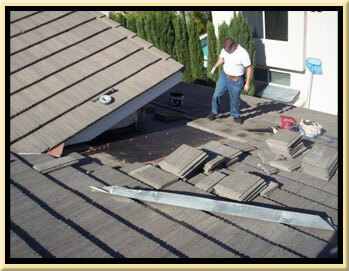 * Methods of repair and repair techniques are at the sole discretion of South County Roofing and the roof technition.